A make-over for the door to my studio. 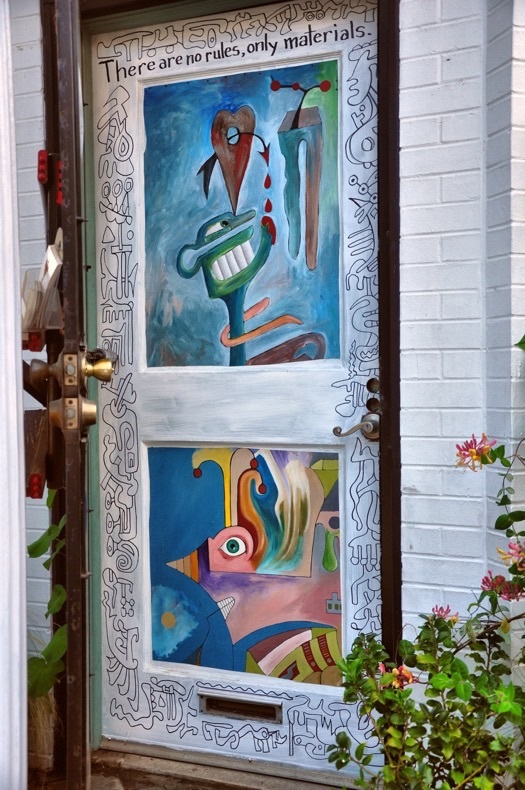 I was going through some of my stash in the basement when I came upon a couple of old painted canvases from maybe 25-30 years ago, and it struck me that sections of them would look good on the outside of the door to my studio. Box cutter in hand, I went to work cuttting out a couple of smaller rectangular pieces from the larger stretched canvases. Then I grabbed a bucket of matte medium, a large brush and a roller and went to work gluing the sections to the door. What fun! This is a work in progress and next I’ll be painting the abstract shapes freely drawn with a broad-tipped sharpie around the edges. Who knows what else I may add before I proclaim it finished. Never fear. I’ll keep you posted. Thanks, Tracy. Not sure Betsy likes it. She’s planted morning glories to grow up my security door.